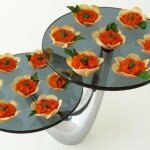 February 28, 2013 By This post may contain affiliate links. 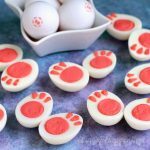 The Easter Bunny found the perfect treats to stick into your kids Easter Baskets! These Almond M&M Candy Carrots are simple to make and great gifts to hand out to your family! This past December I created Candy Christmas Lights using colorful Almond M&M’s and green Mike and Ike Candies and they quickly became one of my top ten posts. 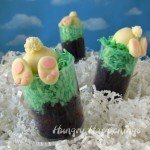 They were definitely one of the simplest edible crafts I have ever made. 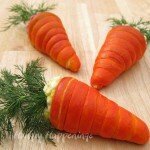 When I was brainstorming ideas for Easter, my wonderfully creative exchange student suggested I make carrots like the light bulbs. Brilliant, right? 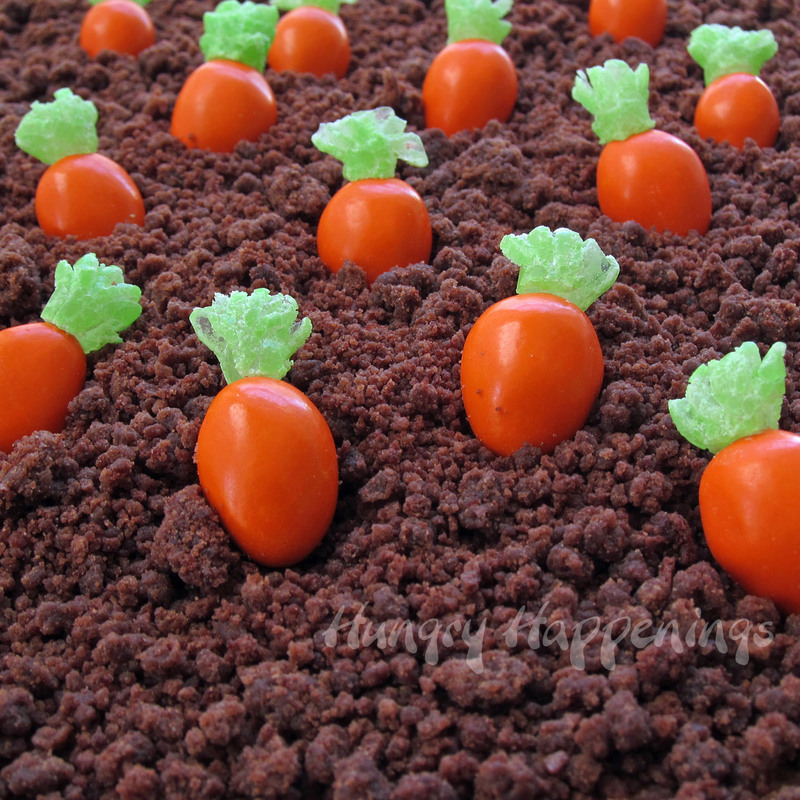 These tiny little candy carrots can be served in a candy dish or used to decorate cakes and cupcakes. 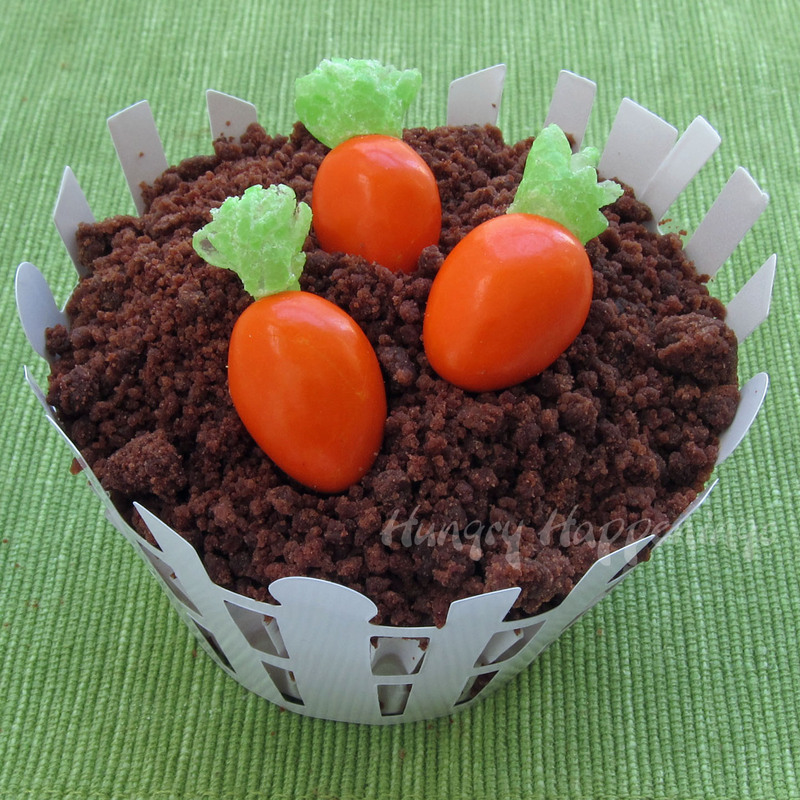 To make my cupcake pictured above, I just topped a frosted cupcake with some cake crumbs and added a few carrots. Cut green Mike and Ike candies in half. 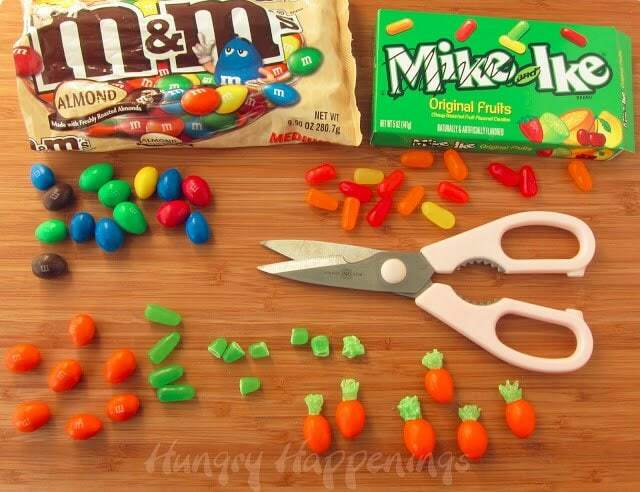 Use the kitchen shears to cut the green candies so that they look like the greens on top of a carrot. Just make lots of snips all over the candy, leaving the sticky side flat. Press the sticky side of the Mike and Ike up against the more rounded tip of the orange Almond M&M. That’s it! Now go make some carrots. Use Wilton’s Picket Fence Cupcake Wrappers to create this cupcake. 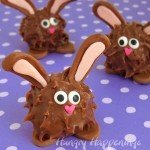 What a cute idea, I pinned it to my Easter board. Thanks for sharing. Cheers! You are so creative! This will be great for my friends at work. Thank you! 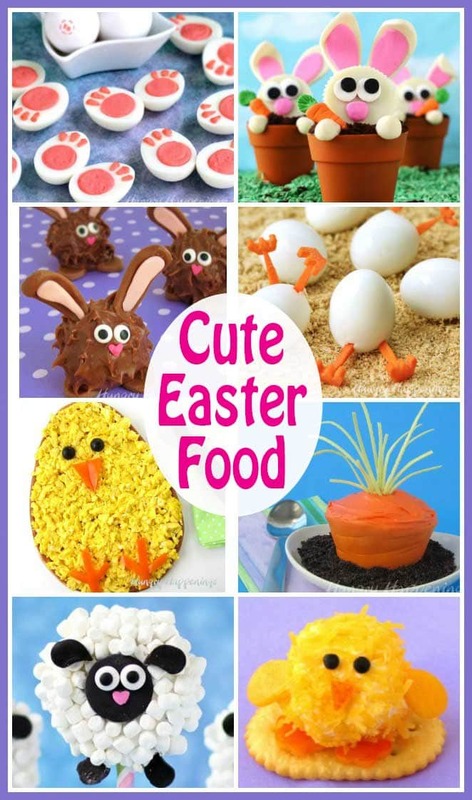 This IS brilliant – it's so simple and looks just like little carrots!! Just curious since I notice your box is like this too.. Why is the name Mike scribbled out on all the boxes of Mike and Ikes? I noticed this while shopping recently. As far as the name Mike being scribbled out, it's a marketing thing. Apparently Mike and Ike are fighting and they no longer want to be on the box together. I don't quite understand the marketing concept. I'll be curious to see if Mike and Ike reconcile! It looks like you could also do this with grape tomatoes for a healthier or nut-free version. WHAT FUN!!!! Gonna "plant" a carrot garden with my grandgirls!!! 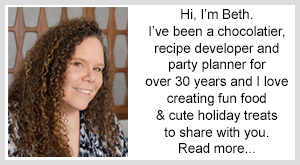 Thank you so much for your creative, fun ideas!!!! What is the "dirt" made of? 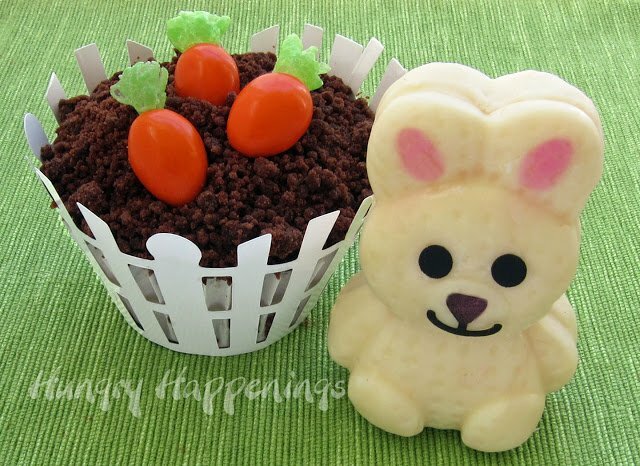 The dirt I used is actually brownie crumbs, but cake crumbs, or crushed chocolate cookies would work just as well. That's so amazing and brilliant!! You are so creative!! Great idea! Beautiful, light and I think it is very appetizing! Thank you. Adorable and even I could follow those directions. Must pin this. Love these!! 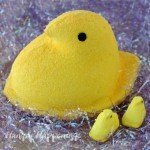 So simple to make and absolutely adorable! Very clever! These are awfully cute. I made the dirt out of Oreos and some fudge brownies and butter.worked like a charm. Glad to hear it worked so well.